On 20 October 2014, I went back to work again, much refreshed. By then, Sophie was 3 1/2 months old and “old and wise enough” to go to nursery.  Fortunately, I had not been completely out of circulation as I wouldn’t have known where to start if I had. During my maternity leave (for the second time, only it was better planned this time), Ruben experienced how flexible you have to be in sales and marketing. But of course it can only be a good thing for mutual understanding to experience what the other person does. Especially in a family business. I have to conclude that, as a board (but especially as a family), we only become closer by taking on each other’s duties during absences. Now, I’m fortunate that Jac and Ruben don’t have maternity leave ... so to me it all seems reasonably clear. My first surprise was waiting for me on my (still empty) desk – which I turned into an “active” workstation in no time – a photograph of Mathijs and Sophie with “welcome back” written on it. Had they actually missed me at the office? I had made a start, with my diary still empty, so we could get to work again. I received an update from Ruben about everything that had happened and he moved backed to Kokstraat. I got my team back again. It’s great that I came back at the start of the boat show season. During my leave I had looked in on Amsterdam In-Water Boat Show and then we started looking for new staff for our sales team to make up for two colleagues who were about to retire. Lars Franken and Jeroen Opheij started work on 1 November. Maybe you’ve already caught sight of them in our showroom. 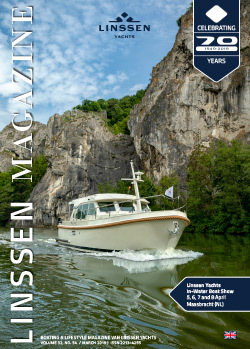 And if not, they’re keen to meet you as a Linssen customer (or prospective customer) to learn why you’re choosing a Linssen. I’d therefore like to invite you to “challenge” Lars and Jeroen. They will at least do their best to persuade you! This made the sales team 200% stronger during the de Linssen Yachts Boat Show. We are now in March 2015 and once again the collection weekend is over and gone. This year it was busier than ever. We are looking forward to the “real” start of the boating season (at Easter) hoping for a lot of good weather. For you and for us. Because, let’s be honest, sailing in fine weather is really much more fun than in the rain. I wish you a great boating season and if you’re anywhere near Maasbracht, do pop in. We’ll be happy to see you!